Every Objective C type is a combination of a base type, a set of type arguments (optional, for parameterized classes) and a list of protocols. 'C' is an ObjCInterfaceType C. It is sugar for an ObjCObjectType with base C and no protocols.
' is a specialized ObjCObjectType with base C, type arguments 'C*', and protocol list [P]. 'id' is a TypedefType which is sugar for an ObjCObjectPointerType whose pointee is an ObjCObjectType with base BuiltinType::ObjCIdType and no protocols.
' is an ObjCObjectPointerType whose pointee is an ObjCObjectType with base BuiltinType::ObjCIdType and protocol list [P]. Eventually this should get its own sugar class to better represent the source. Definition at line 5550 of file Type.h. Definition at line 5589 of file Type.h. Definition at line 614 of file Type.cpp. References getTypeArgsAsWritten(), clang::ObjCProtocolQualifiers< ObjCObjectType >::initialize(), memcpy(), clang::Type::ObjCObjectTypeBits, clang::ExtQualsTypeCommonBase::QualType, clang::Type::setContainsUnexpandedParameterPack(), clang::Type::setDependent(), and clang::Type::setInstantiationDependent(). Definition at line 5596 of file Type.h. Definition at line 5693 of file Type.h. Definition at line 1482 of file Type.cpp. References clang::Type::castAs(), clang::Decl::getASTContext(), getInterface(), clang::ASTContext::getObjCInterfaceType(), clang::ObjCInterfaceDecl::getSuperClassType(), getTypeArgs(), clang::ObjCInterfaceDecl::getTypeParamList(), isUnspecialized(), clang::ObjCTypeParamList::size(), clang::QualType::substObjCTypeArgs(), and clang::Superclass. Definition at line 5691 of file Type.h. Gets the base type of this object type. Definition at line 5613 of file Type.h. Referenced by clang::ASTContext::applyObjCProtocolQualifiers(), clang::CodeGen::CGDebugInfo::completeRequiredType(), getTypeArgs(), getTypeInfoLinkage(), clang::Type::isIncompleteType(), isKindOfType(), isSpecialized(), mangleAArch64VectorBase(), stripObjCKindOfTypeAndQuals(), clang::ASTNodeImporter::VisitObjCObjectType(), and clang::ASTTypeWriter::VisitTagType(). Gets the interface declaration for this object type, if the base type really is an interface. Definition at line 5785 of file Type.h. Referenced by clang::Sema::ActOnCompatibilityAlias(), clang::ASTContext::areCommonBaseCompatible(), clang::ASTContext::canAssignObjCInterfaces(), clang::Sema::checkInitMethod(), clang::Sema::CheckObjCForCollectionOperand(), computeSuperClassTypeSlow(), clang::CodeGen::CodeGenFunction::EmitObjCMessageExpr(), EvaluateBinaryTypeTrait(), FilterMethodsByTypeBound(), clang::ObjCObjectPointerType::getInterfaceType(), clang::Type::getObjCSubstitutions(), isNSStringType(), clang::Sema::LookupMethodInObjectType(), maybeAdjustInterfaceForSubscriptingCheck(), ShouldTryAgainWithRedefinitionType(), and tryEmitSpecializedAllocInit(). Retrieve the type of the superclass of this object type. 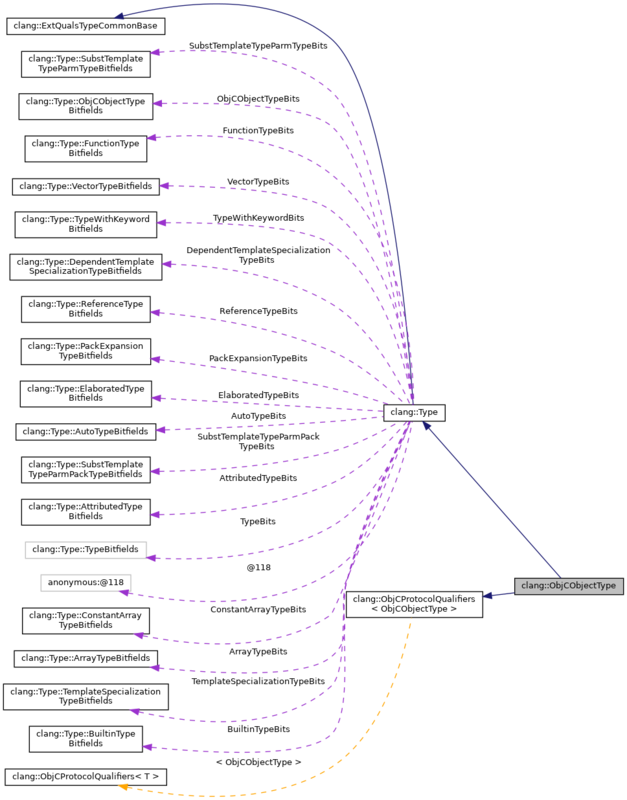 This operation substitutes any type arguments into the superclass of the current class type, potentially producing a specialization of the superclass type. Produces a null type if there is no superclass. Definition at line 5678 of file Type.h. 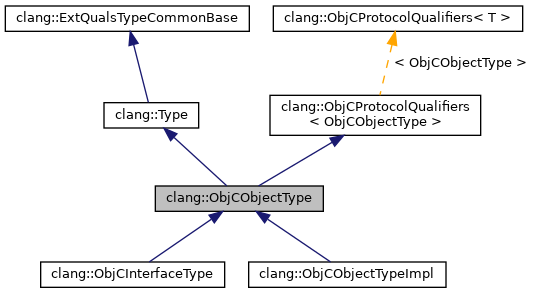 Referenced by clang::ASTContext::areCommonBaseCompatible(), clang::ASTContext::canAssignObjCInterfaces(), getMostInformativeDerivedClassImpl(), and clang::Type::getObjCSubstitutions(). Retrieve the type arguments of this object type (semantically). Definition at line 664 of file Type.cpp. References getBaseType(), getTypeArgsAsWritten(), and isSpecializedAsWritten(). Referenced by clang::ASTContext::areCommonBaseCompatible(), clang::ASTContext::canAssignObjCInterfaces(), computeSuperClassTypeSlow(), clang::Type::getObjCSubstitutions(), and mangleAArch64VectorBase(). Retrieve the type arguments of this object type as they were written. Definition at line 5661 of file Type.h. Referenced by clang::ASTContext::applyObjCProtocolQualifiers(), clang::ASTContext::areCommonBaseCompatible(), getTypeArgs(), ObjCObjectType(), stripObjCKindOfTypeAndQuals(), clang::ASTNodeImporter::VisitObjCObjectType(), and clang::ASTTypeWriter::VisitTagType(). Whether this ia a "__kindof" type (semantically). Definition at line 682 of file Type.cpp. Referenced by clang::ASTContext::areCommonBaseCompatible(), clang::ASTContext::canAssignObjCInterfaces(), mangleAArch64VectorBase(), stripObjCKindOfTypeAndQuals(), and clang::ObjCObjectPointerType::stripObjCKindOfTypeAndQuals(). Whether this is a "__kindof" type as written. Definition at line 5667 of file Type.h. Referenced by clang::ASTContext::applyObjCProtocolQualifiers(), isKindOfType(), clang::ASTNodeImporter::VisitObjCObjectType(), and clang::ASTTypeWriter::VisitTagType(). Definition at line 5619 of file Type.h. Referenced by clang::Sema::checkInitMethod(), LookupMemberExpr(), and ShouldTryAgainWithRedefinitionType(). Definition at line 5615 of file Type.h. Referenced by clang::Sema::checkInitMethod(), FilterMethodsByTypeBound(), LookupMemberExpr(), and ShouldTryAgainWithRedefinitionType(). Definition at line 5633 of file Type.h. Definition at line 5632 of file Type.h. Definition at line 5624 of file Type.h. Definition at line 5623 of file Type.h. Definition at line 5625 of file Type.h. Determine whether this object type is "specialized", meaning that it has type arguments. Definition at line 646 of file Type.cpp. Referenced by clang::ASTContext::areCommonBaseCompatible(), clang::ASTContext::canAssignObjCInterfaces(), and mangleAArch64VectorBase(). Determine whether this object type was written with type arguments. Definition at line 5644 of file Type.h. Definition at line 5690 of file Type.h. Determine whether this object type is "unspecialized", meaning that it has no type arguments. Definition at line 5650 of file Type.h. Referenced by computeSuperClassTypeSlow(), and clang::Type::getObjCSubstitutions(). Definition at line 5654 of file Type.h. Definition at line 699 of file Type.cpp. References clang::Type::getAs(), getBaseType(), clang::ASTContext::getObjCObjectType(), clang::ASTContext::getQualifiedType(), getTypeArgsAsWritten(), isKindOfType(), clang::ObjCProtocolQualifiers< ObjCObjectType >::qual_empty(), clang::SplitQualType::Quals, clang::ExtQualsTypeCommonBase::QualType, clang::QualType::split(), and clang::SplitQualType::Ty. Definition at line 5552 of file Type.h.